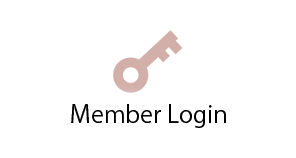 First, let’s set your pitch with ichi-no- ito (the first, bold string).Please set the ichinoito with this pitch(“ichikotsu”442Hz）Does the sting make a good resonance? 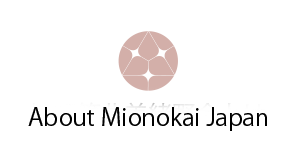 Next, please select the pitch of the music you play, from the chart below.You will hear the sound of each of three strings (一(ichi, 1), 二 (ni, 2), and 三(san, 3))twice for each. 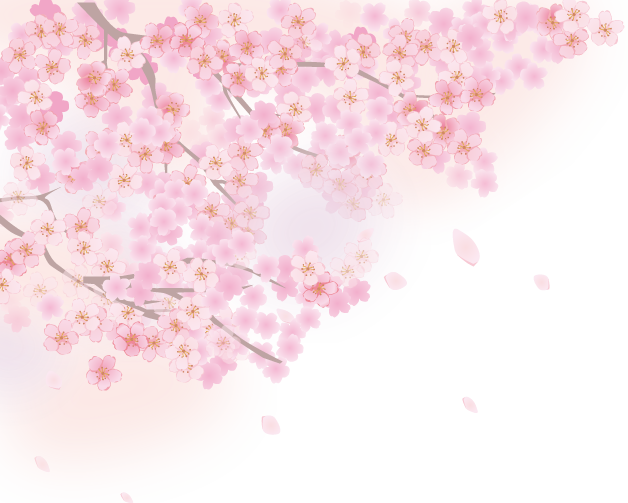 You　will hear it slowly and tune your strings of a shamisen to the same tone. ※chi-no-ito on “Mizuchoshi”is very low.he sound source you will hear is the right tune. There are very useful mechanical tuners.You can use it as it is very easy to tune. First, you need to sit down, open your knees to the width of your waist.Make space about the size a couple of fists between your knees.Straight up your hipbone and spine and supportwith your abdomen.Relax your upper body and shoulders.Please have an image that your spine straight up from the center of your pelvis.Make abdominal breathing gently: inhale and exhale like in Yoga. Good posture sitting down on the floor is VERY important. 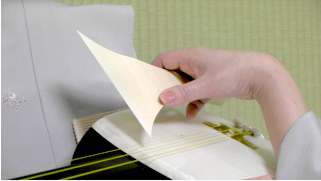 Next, place a rubber pad on the middle of your right lap where you place your shamisen body.Please do not hold it too close to your body.Then, let your shamisen lean to your body.The half of the shamisen body is out of your lap. 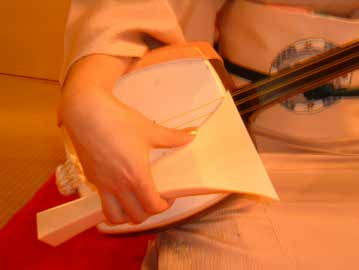 Please do not fully place all the shamisen body on your lap.If you hold the shamisen body fully on your lap, the shamisen is positioned too high. Now, look your position in the mirror. 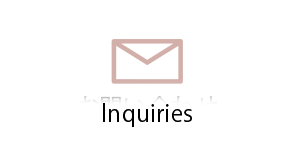 Check it if it is like the photo above. Bent your right hand in a circle, and gently hold a bachi.Relax your right hand, holding a bachi as if holding an egg. Place your thumb on the mountain edge of bachi, and hold another　side of bachi with your index, middle and the third fingers in a line softly. Your thumb and little fingers are on the same side. Please lengthen the thumb gently.Place where the fingertip of your thumb touches the mountain edge of the bachi exactly …The place which you should grasp is only one spot to begin with playing. 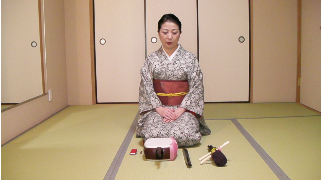 As keep holding a bachi softly, place your right arm on the shamisen body and release the weight of your right arm on it, as if it is like an arm rest. Relax your both shoulder. When　your both shoulders be relaxed, your both wrists fall down.Your fallen list and hand holding a bachi, then the center edge of bachi is pointed the third string at the edge of surface of body, that is the right position.Now, your posture holding a shamisen and a bachi is good. 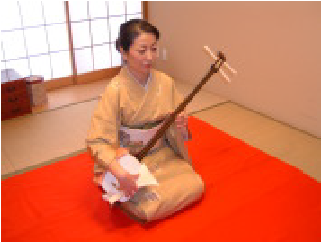 Holding a bachi and position its handle with shamisen neck (sao)., This is good balanced posture to play the shamisen. check1：Keep your upper body straight. Your nose, chin, bellybutton,and the center of your lap; all of them are in a line. check2：Keep your both shoulders in horizontally. 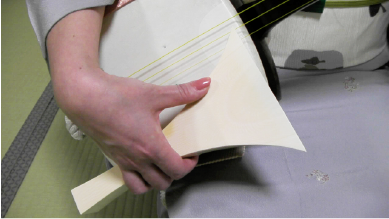 check3：The neck (sao) of your shamisen is at 45 degrees on your lap. check4：The center line of the bachi is in parallel with your shamisen’s sao. 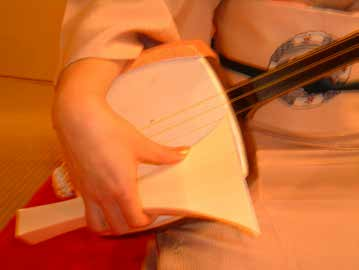 check5：One edge of your bachi is on the edge of your shamisen body and on the third string when you begin with your play. 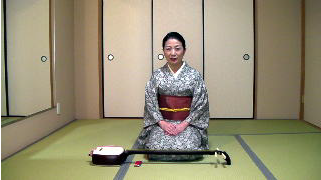 Please see the photos below.Jiuta shamisen values the delicacy of tones.The sound is very sensitive.To make such tones, hit the very edge of the shamisen body with a bachi.Hit down the bachi straightly and vertically to the edge of the shamisen body.Big swinging performance with a bachi is not Jiuta style. 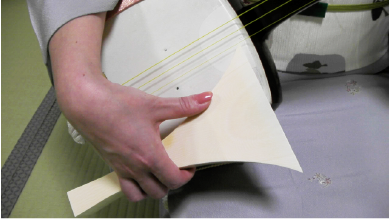 First, play with the third (bottom of three) string.Move your bachi vertically to the surface of your shamisen, from your first holding position. Secondly, play with the second string.Swing the point of your bachi up to the second string and drop it vertically to the surface of your shamisen. Lastly, play with the first string.Shift the point of your bachi to the first (top of three) string like swing it. 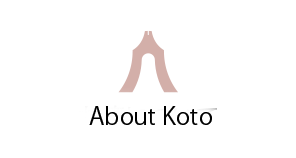 For most of the time, use the index finger, the middle finger and the forth finger to press tsubo points (equivalent to pitches).The thinnest third string is pressed with your nail.For other two strings, however, be careful not to use nail due to the sound in result is not desirable. When you hold your shamisen’s neck,the bottom of your thumb is placed on a curb on back side of your shamisen neck. 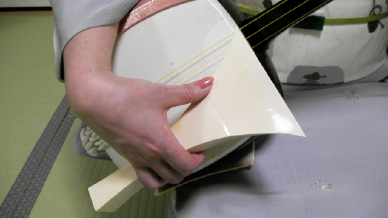 Please see the photo below.Imagine your shamisen’s neck is in it.The way and direction of the fingers hold the neck of your shamisen to press tsubo tightly. hape of your holding is different like below. 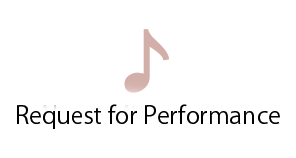 The second position on the third string(above). 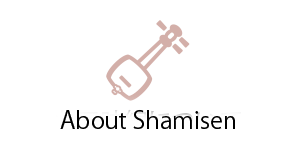 The second tsubo-position on the second string (above). 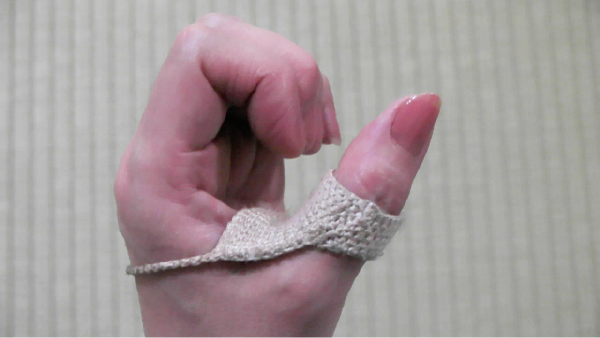 The first string as well.Like photos show, bring your hand to the upper side of the neck and place your thumb gently. One more tip; caring your left hand’s nails is also important.Your left hand’s nails are better be cut short and straight to press tsubo.It helps to press the right point tightly, which makes more beautiful sound. For beginners, your left hand fingers (specially index finger) need some care. As you get used to, making progress, your index finger top get stiffer.When you practice a lot at once, we protect left index finger’s nail with a piece of a cocoon. 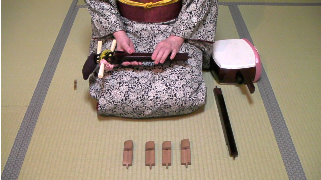 The finger top is called “ito-michi (sting’s road)” for shamisen players.Basically, any finger uses the center edge of each nail to place the position of the strings.Only index nail uses a little right-side from the center to position.To have a beautiful sound of hajiki, keep your special ito-michi, that would be excellent for your performance. There are two key points to make a beautiful sound of hajiki. 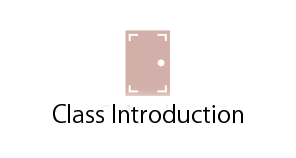 Press the correct tsubo point tightly. Then, flick a string near the tsubo. Enjoy beautiful resonate sound of hajiki. 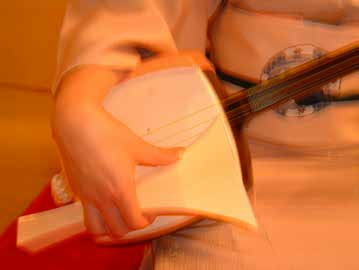 As you might have noticed after reading this long text, it is never easy to play correctly.Though I have done my best to give basic tips to play the shamisen.I would be most happy if this introduction could give you a slight inspiration how you enjoy shamisen. Copyright© MIONOKAI JAPAN All Rights Reserved.